The economy pages display information and statistics about your company. When you need information about old payments and income and desire to view the progress your company is making, the economy pages are where to look. This page displays information about deposits to, and withdrawals from your account. Here, you can view information about every transaction made by your company and the impact that these have on your company. The transactions page is a great asset for finding out how much money your buildings make and how much cash you get from goods sold on the market. The list of transactions is very easy to understand. Each transaction is marked with a date, a text describing what kind of transaction it is and the amount of money that has been deposited or deducted. The list contains transactions up to a week old. Transactions older than one week are removed to speed up the loading of the game. Black, positive numbers show income. This is money deposited to your account. Red, negative numbers show expenses. This is money deducted from your account. By clicking on a transaction, you will be given detailed information about where the money came from or how they were spent. Here, you will also be able to see how the transaction has affected your company value and your account balance. The in and out page provides you with a three day overview of your company's incoming and outgoing resources. Keeping an eye on the "In and out" page can help you see whether you are using your resources efficiently. When viewing the changes to the amount of goods held by your company, you can see how much raw materials your factories consume and how many products your shops sell from day to day. Black, positive numbers mean that you have purchased goods (measured in units) from the market or produced them in your factories. Red, negative numbers indicate that goods have been removed from your warehouse. This includes goods sold on the market, consumed in factories and sold in shops. When viewing the changes to your savings, you can see how much money has been gained and how much has been spent during the last three days. Again, black numbers mean money made, while red numbers mean money spent. This is useful for seeing what you make your money on, and where your expenses lay. Also, it is important to make sure you have money when you need them, for instance when it is time to pay your staff or make down payments on your loans. 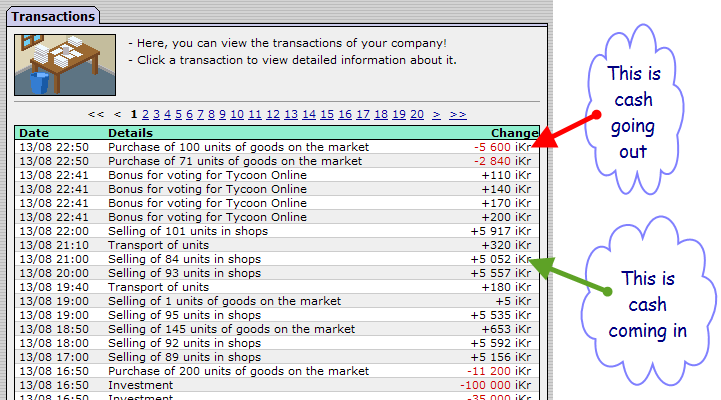 The changes page displays changes in your company's finances. You may view you company value, your bank balance, your company ranking and the value of the company stock and how much this has changed during the past 10 days. The changes page will function only when your company has existed for more than 2 days. On top of the screen, you can choose what changes to view. Clicking on any one of them will display a table over the the two previous days as well as the current one. Clearly stated will be value before, value after, changes in iKr/ranking and the percentile change. 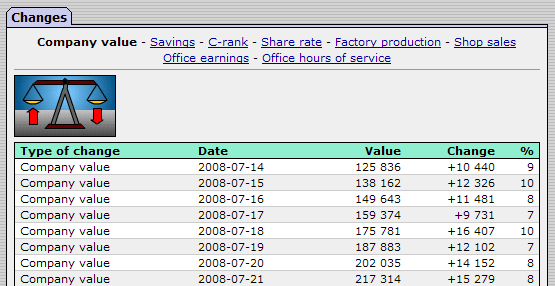 This page was last modified on 22 August 2008, at 03:13.